ColourPop Gimme More! Highlighter Palette in Extra, Upgrade, Bottomless, Full Service, Bigger and Better, & Total Package. 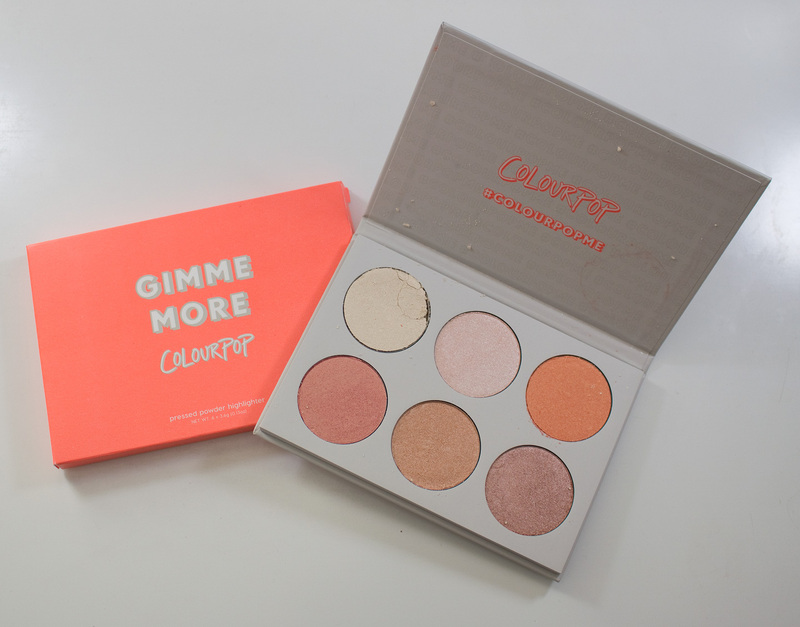 The ColourPop Gimme More! Highlighter Palette retail for $18US for 6 x 3.6g / 0.13oz of product. ColourPop Gimme More! 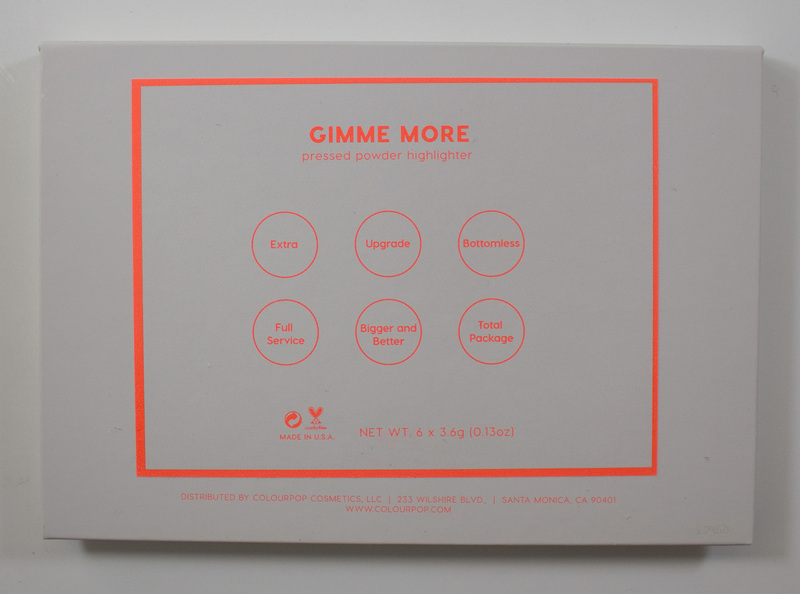 Highlighter Palette box art backside. ColourPop Gimme More! Highlighter Palette art backside. EXTRA: Dimethicone, Zinc Stearate, Silica, Caprylic/Capric Triglyceride, Ptfe, Boron Nitride, Synthetic Fluorphlogopite, Hdi/Trimethylol Hexyllactone Crosspolymer, Dimethiconol, Phenoxyethanol, Caprylyl Glycol, Tin Oxide, Ethylhexylglycerin, Hexylene Glycol, Iron Oxides (CI 77491), Mica (CI 77019), Titanium Dioxide (CI 77891). UPGRADE: Dimethicone, Synthetic Fluorphlogopite, Zinc Stearate, Silica, Boron Nitride, Dimethiconol, Phenoxyethanol, Caprylyl Glycol, Ethylhexylglycerin, Hexylene Glycol, Tin Oxide, Bismuth Oxychloride (CI 77163), Iron Oxides (CI 77491, CI 77492), Mica (CI 77019), Titanium Dioxide (CI 77891). BOTTOMLESS: Dimethicone, Zinc Stearate, Ptfe, Boron Nitride, Silica, Caprylic/Capric Triglyceride, Synthetic Fluorphlogopite, Hdi/Trimethylol Hexyllactone Crosspolymer, Phenoxyethanol, Dimethiconol, Caprylyl Glycol, Ethylhexylglycerin, Hexylene Glycol, Iron Oxides (CI 77491), Mica (CI 77019), Red 6 (CI 15850), Red 40 Lake (CI 16035), Titanium Dioxide (CI 77891), Yellow 5 Lake (CI 19140). FULL SERVICE: Dimethicone, Zinc Stearate, Ptfe, Caprylic/Capric Triglyceride, Silica, Boron Nitride, Synthetic Fluorphlogopite, Hdi/Trimethylol Hexyllactone Crosspolymer, Dimethiconol, Phenoxyethanol, Caprylyl Glycol, Ethylhexylglycerin, Hexylene Glycol, Tin Oxide, Iron Oxides (CI 77491), Mica (CI 77019), Red 7 Lake (CI 15850), Titanium Dioxide (CI 77891). BIGGER AND BETTER: Synthetic Fluorphlogopite, Dimethicone, Zinc Stearate, Ptfe, Caprylic/Capric Triglyceride, Boron Nitride, Silica, Hdi/Trimethylol Hexyllactone Crosspolymer, Phenoxyethanol, Dimethiconol, Caprylyl Glycol, Ethylhexylglycerin, Hexylene Glycol, Tin Oxide, Carmine (CI 75470), Iron Oxides (CI 77491), Mica (CI 77019), Titanium Dioxide (CI 77891). TOTAL PACKAGE: Synthetic Fluorphlogopite, Dimethicone, Zinc Stearate, Ptfe, Caprylic/Capric Triglyceride, Boron Nitride, Silica, Hdi/Trimethylol Hexyllactone Crosspolymer, Phenoxyethanol, Dimethiconol, Caprylyl Glycol, Tin Oxide, Ethylhexylglycerin, Hexylene Glycol, Iron Oxides (Ci 77491), Mica (Ci 77019), Titanium Dioxide (Ci 77891). The formula for these highlighters are buttery in nature as the glid smoothly over bare skin and other products on the face. They feel like the best highlighters on the market for this reason and are easy to sheer out as needed. Some of the shade can double as eyeshadows are well with a primer. 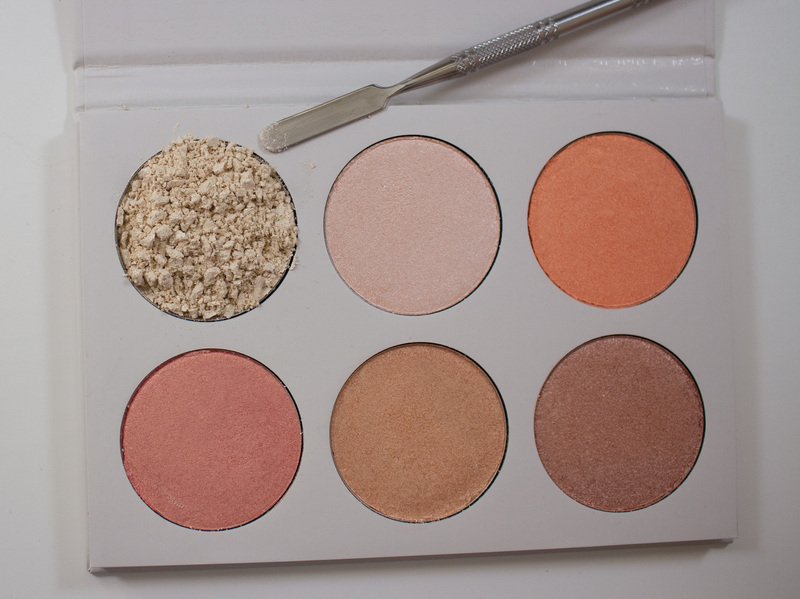 ;) They are on the soft side though so be careful not to drop this palette. Extra is an off-white with a pale gold shimmer finish. Upgrade is a pale pink is a with a shimmer finish. Bottomless is a peach with gold with a shimmer finish. Full Service is a warm pink with gold shimmer finish. Bigger and Better is a light peach with gold shimmer finish. Total Package is a rich rose gold with a shimmer finish. Wear: The shades I get over 8 hours on bare skin. Over foundation, I found these lasted all day for me. Packaging: Is a simple cardboard box with a magnetic closure. Daylight swatches: Extra, Upgrade, & Bottomless. Flash swatches: Extra, Upgrade, & Bottomless. The shade Extra was shattered so I repressed it with alcohol. I didn't take an after shot, but you can repress these powder with rubbing alcohol and the preform just the same if one does shatter. I really like the formula of these highlighter powders. 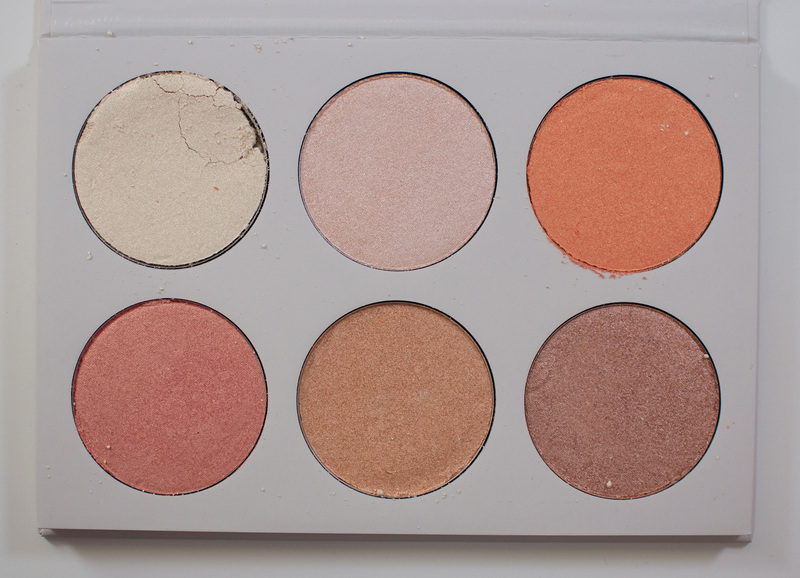 My only issue with this palette is that it's not going to work for a pale girl like me as I can only use the shades Extra and Upgrade are light enough for me the rest would work on medium to deeper skin tones. I'm looking forward to ordering some of the single pan highlighters in the future.